16 Foot Inflatable Outdoor Movie Screen & Projector | San Diego Kids Party Rentals | inflatable | San Diego Kids Party Rentals | bounce house rentals in San Diego and Coronado, CA. Inflatable 16-Foot Outdoor Movie Screen, Audio & Projector Rentals!! Powerful Sound, Superior Image! Magically Bringing Movies to You! This high-quality 16' Inflatable Outdoor Movie Screen inflates in under a minute and has the flexibility to accommodate either front-projection or rear projection. The movie screen has a lightweight frame so that it is free-standing and allows theatre-quality movie projection. The 21' x 18' inflatable screen provides 16' of movie viewing space and comfortably fits audiences of up to 300 people, or 400 people if they are sitting in closely arranged chairs. By hosting your own Outdoor Movie Night -- you'll provide an incredible experience for guests in your backyard, community parks and recreation areas, homeowner association clubhouse lawns, military bases, school yards, sporting team playing fields, church grounds, or even in the neighborhood cul de sac. Everyone loves going to the movies and will love that you're bringing the movies to them! Outdoor Movie Fun for the entire family! Remember: Popcorn Goes Great with Movies! with movies by the Pool! It's a great way to spend a summer evening in the back yard -- or, plan an indoor Dive-In Movie Night at your school, YMCA, or recreation center! You Simply Bring the Movie and Guests, We'll Bring the Rest! Rentals are based on up to a 3-hour movie length. If you plan to show a "Double-Header" Movie Night, we can extend the duration of time that the Movie Attendant will be on-site for an additional charge. For on-line bookings, please select the appropriate duration below. 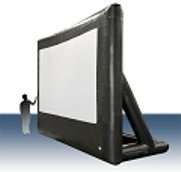 This portable outdoor movie screen and audio-visual system can also be used for video games, presentations (connects to a laptop for PowerPoint or other presentation software), NFL football parties by connecting to a T.V. (consider the lighting and time of day of the game), or Music Videos for Dance Parties. Access to electrical outlet or generator within 100 feet of the projector and screen set-up location. All sprinkler systems must be turned-off prior to the start of the movie and remain off until after equipment take-down. A dry lawn is preferable for the viewers on blankets. You obtain the necessary permits and/or permission to use parks, recreation areas, club houses, etc. San Diego Kids' Party Rentals is fully insured and can list your venue as additionally insured on our policy if required. We are already listed with most San Diego parks and local community centers. You select and provide the movie and adhere to any relevant licensing conditions. Typically licenses are not required for back-yard private movie showings, but they are required for any public showing. For details on obtaining licenses, go to www.swank.com or call them at 1-800-876-5577. Swank.com has roughly 80 percent of all movie titles. Please call them at least 2-3 weeks before your event to ensure your permit.